After my older sister went away to college, she reported that it was easy to tell which of the students in her dorm had grown up in apartment buildings (as we did), and which had grown up in houses. The former apartment dwellers put their laundry in the washing machine, came back half an hour later, transferred it to the dryer, then showed up when it was dry, folded it, and left. Those who had grown up in houses put their laundry in, came back hours later, and were surprised to find that someone had removed their clothes from the washing machine and left them in a wet pile. Yes, it’s a whole different culture for those of us who live in apartments and have to share laundry facilities with our neighbors. I am lucky enough to have a laundry room in the basement of my building. Others here in New York City aren’t so fortunate and have to use the facilities at local laundromats. 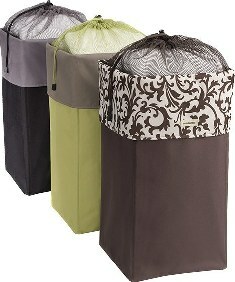 Thanks to some new choices at the Container Store, it’s easier than ever to get that laundry from here to there. The latest addition to our home is the Hamper with Wheels. It has a slim profile, fits beautifully into a closet, holds a weeks worth of laundry, and easily rolls to the elevator when laundry time comes around. 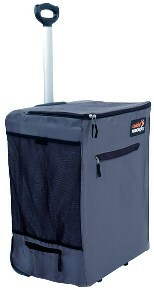 If you’ve got to go outside to get your laundry done, you’ll appreciate the Portable Laundry Hamper. It zips up completely to ensure that nothing falls out on the way. 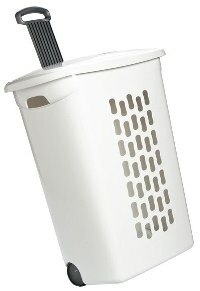 While I was in the laundry aisle, I decided to purchase an attractive laundry basket for my teenage daughter’s room, in the hope that it would prevent the pile of clothes that tends to collect on her floor and her chairs. Well, that is still a work in progress, but the good news is that having her own laundry basket has empowered her to start doing her own laundry. We bought the attractive yet portable Laundry Box by reisenthel . Try it – maybe it will work magic in your teenager’s room!